Competence development is important for individuals and organizations. 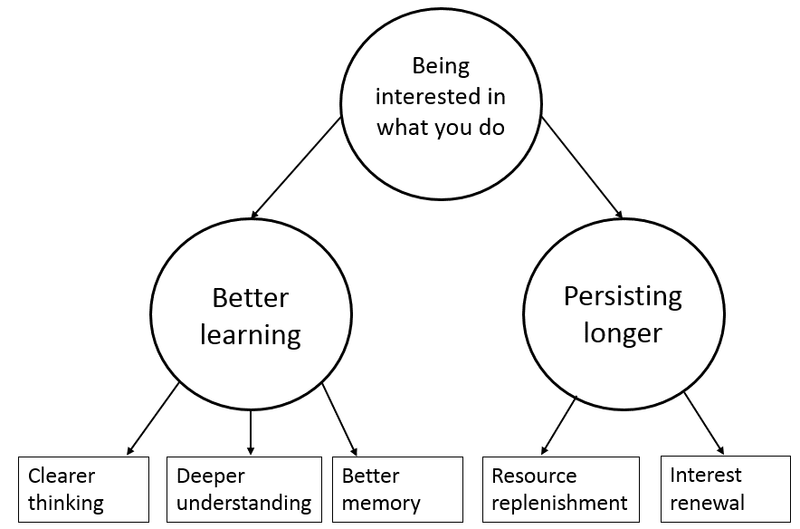 This article outlines the advantages of interest-focused development which is to structurally engage yourself with and train yourself in what interests you, both in the short and the long term. An important motivation of people is what psychologists call competence motivation (Elliott & Dweck, 2005). Competence motivation is the tendency of people to make efforts to retain their level of competence and to develop it further. People from all cultures and of all ages have this motivation. The extent to which people feel competent contributes to their well-being and their functioning. Competence development will not come about automatically; it requires an investment. For anyone who wants to become more competent, the question is therefore important how that investment can be made most wisely. A first strategy is to use a demand focus in which you try to assess for which types of competences there will be a demand in the future. Then, you try to develop these competences. The rationale behind this way of working is: if you try be able to supply that for which there will probably be a demand, you will increase the likelihood that you will be able to make a living from what you will have learned. A second strategy is to use a strengths focus. This approach means that you assess where your strengths lie and then primarily work to develop these strengths further. The rationale behind this approach is: if you build on what you are already good at you utilize what you already have and you will probably learn faster. Thus you will increase the likelihood that there will be work for you in the future. While these strategies sound reasonable and can lead to success they can also lead to some practical problems. A demand focus can lead to a motivational problem. That which is in high demand does not necessarily have to be interesting or enjoyable to you. In that case, how will you manage to remain committed to it and to persist your investment? A strengths-focused approach can have as a disadvantage that you may constrain your own development. What you perceive as your strengths is necessarily based on what you have experienced. By allowing yourself to experience new things, regardless of whether you are good at the or not, you may, with effort and persistence, develop new strengths which you may never have considered. Both demand-focused and strengths-focused development sound logical but are needlessly restrictive. This article argues for a different strategy: interest-focused development. In this approach you mindfully ask yourself what interests you and you primarily focus your attention on this. Interest-focused development can overlap with demand-focused and strengths-focused development but it has different starting point. Also, is has different and bigger advantages, both in the short term and in the long term. Before mentioning these, I will explain what interests are. The word interest refers to a mental state of curiosity and enjoyment or concern with respect to an activity or a subject which makes you want to engage more in it. Being interested in something thus may mean that it makes you curious, that you enjoy it or that affects or concerns you. The motivation to find things interesting can both come from within us and from our environments. Each person is intrinsically motivated to seek interaction with his or her environment and to explore and learn things. When we do things purely because we find them enjoyable we are intrinsically motivated (Deci & Ryan, 2012) and our motivation comes from within. At the same time our interests can be triggered by our environment. These triggers can be spontaneous events, such as reading an article or hearing a song, but they can also be created by other people, such as parents, teachers and managers. In this case we speak of extrinsic motivation. Many people know that certain external control mechanisms, such as punishment and reward, supervision, grades, controlling language, etc., can have negatives consequences. These control mechanisms can both undermine people’s intrinsic motivation and the process of internalizing external expectations, values, norms and rules. But it is not true that external motivation in itself is a bad thing. These external triggers and external directions (expectations, norms, values, rules, etc.) can, under certain conditions, be fully internalized and integrated by the individual. This process of internalization and integration happens best when the need for autonomy of the individual is supported, when reasons for expectations are clearly explained and when rules and expectations themselves are congruent with people’s need for autonomy, competence and relatedness. When this is the case, people tend to perceive external guidance and direction as legitimate and they will voluntarily act in accordance with them. Eventually these external expectations will be fully integrated and they will have become ours. What interests us is thus not only a matter of intrinsic motivation but also of internalized and integrated extrinsic motivation. We all have different backgrounds, find ourselves in different situations, and undergo different experiences. It is therefore not surprising that we find different things interesting. But, on an abstract level, we can say some general things about which ideas, experiences and things are interesting to people. To be interesting things must meet three requirements: newness, complexity, and understandability (Silvia, 2008). When something is not new we experience it as well-known and perhaps boring and we are less likely to be triggered to give it our full attention. When something is not complex we do not feel challenged by it. And when we experience something as incomprehensible the threshold can be too high for us to start exploring it. When events, ideas or objects are new, complex, and understandable, they offer us the opportunity to develop our abilities. As Carol Dweck, author of Mindset, The New Psychology of Success, put it, “We all have interests that can blossom into abilities.” This has to do with a number of psychological mechanisms that operate when we are doing something that interests us. When we are immersing ourselves into something which interests us we find ourselves in a psychological state of attentive engagement and we experience positive emotions. In this type of circumstances we are able to think clearer, understand things more deeply, and remember things more easily (Murphy Paul, 2013) which enables us to learn better and more efficiently. Also, it is easier to persist in an effort when the thing we are working on interests us. This is because the positive emotions we experience while we are working on interesting things cause a replenishment of our energy and personal resources such as attitudes, strengths, optimism, resilience, helpful beliefs, flexibility, and pro-activity (Thoman, Smith, & Silvia, 2011). While we are putting in an intense effort we are, as it were, at the same time refueling our tank. Since building expertise requires a great deal of perseverance, this process of resource replenishment is an important advantage of interest-focused development. There is also another important advantage of interest-focused development. Research has shown that when we follow our interests a mechanism kicks in which automatically encourages and refreshes our interest (Silvia, 2008). This mechanism works as follows. When we find a subject interesting and we focus on it we encounter new information about it. Part of this new information will probably fit well with what we already knew about the subject. But another part of the new information is likely to be, to some extent, at odds which what we already knew. This new information thus creates a certain conflict which we will try to solve, or a gap which we will want to bridge. With interest-focused development our interests may be continually renewed and supplemented. We might call this interest-renewal. Such a focus on interests both has short term and long term advantages. A short term advantage is that people will work with more engagement. Research has shown that work engagement is associated with lots of benefits. For example, engaged workers are more creative and more satisfied with their work and they generally perform better (Bakker & Daniels, 2012). In addition to this, research by Amabile & Kramer (2011) has demonstrated that making progress in meaningful work is one of the most motivating factors in work. What is important, according to Amabile and Kramer, is that you feel that your work is contributing to something which is valuable and important to you. There seems to be an great overlap between the concept of meaningfulness which these authors use and out conceptualization of interest. 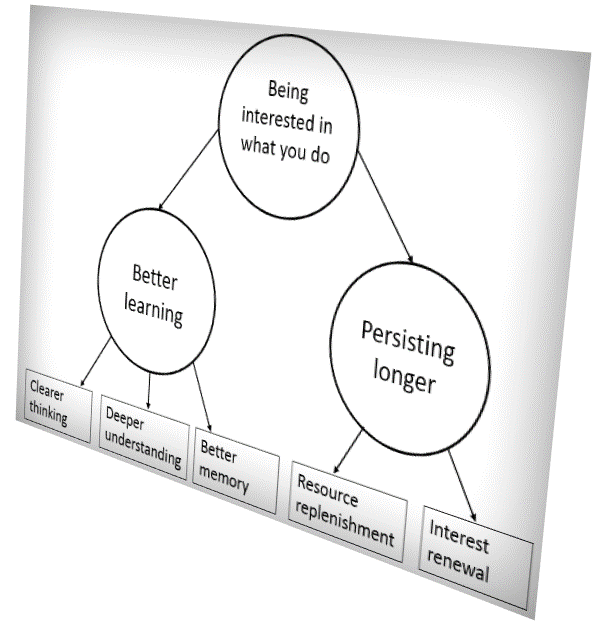 In the long term the advantages of interest-focused development may be even greater. Many studies have shown that achieving great expertise or competence in a great range of fields requires many years of hard work (Ericsson, 1996; Ericsson et al., 2006). The key to becoming very good at practically anything is to put in years of deliberate practice into that activity. How one is able to maintain such efforts is thus a key question. The aforementioned advantages (better learning, resource replenishment and interest fenewal) provide answers to this question. Not only is investing in something which interests you less much harder, you may also wonder if it is worth the trouble at all. Cultivating your own interests is not too difficult. It can be done by asking yourself questions such as: What interests me in this subject? What am I wondering about with respect to this topic? How does this work precisely? What else is known about this? Which things are still unknown about this? What new discoveries have been made? By thinking up these types of questions you may evoke a desire for information which makes it interesting for you to start working and exploring. Also, when you are working and after you have finished your activity you may further cultivate your interest by asking questions like: What did I find interesting about this? What new questions does this raise? What next step might I take? Parents, teachers, and managers who believe in the power of interest-focused development will naturally be curious about whether (and how) we can provoke and cultivate interests in others. The answer to the question is that we can indeed do this providing we do it in a subtle manner. Three not so subtle approaches which are often applied generally turn out to backfire. First, rewarding people for doing an activity, generally does not strengthen interest in the activity but actually it generally weakens it. This effect which is called the discounting principle has been demonstrated in many experiments (for example, see Kohn, 1993). Second, research has shown that emphasizing the future benefits of the activity, in many cases, does not enhance but undermine the interest in the activity (Durik & Harackiewicz, 2007). Third, using a persuasive tone of voice may backfire. When we feel that someone is trying very hard to convince us of something a defensive mechanism tends to kick in which is called the reactance effect (Brehm & Brehm, 1981). This means that we try to protect our autonomy by resisting against the message of which we are trying to be persuaded. Ask questions: instead of explaining things and overwhelming the other person with views and answers, asks questions which focus the attention on the gaps in the other person’s knowledge. The information gaps usually create a curiosity and interest in the other person. Demonstrate: demonstrate your own interest for a subject, for example by spontaneous conversations, expressing your own enthusiasm, or by practical demonstration. Offer support: support the perception of competence of the other person, offer help, encouragement, provide process-focused feedback, etc. That organizations may also benefit from employees following their interests seems logical if you consider that interested employees will learn more effectively and will persist longer. Yet, there may also be a skeptical response to the idea that interest-focused development is useful for organizations. An obvious question which may be asked is: will interest-focused development not create the risk that employees will only be willing to do enjoyable activities and refuse to do things which are not so enjoyable but which still need to be done? The answer to this question is no. Interest-focused development does not imply that you will never have to do tasks which are somewhat tedious. Any job involves both tasks which are interesting and tasks which are less interesting, such as, perhaps, administrative and repetitive tasks. But the interest-focused approach can still be useful in two ways. First, tasks which at first sight seem somewhat less interesting can often be made more interesting by asking yourself questions such as: How can I make this task a bit more interesting? Which aspects of this task do I find somewhat interesting? How can I execute this task in a way which makes it a bit more interesting for me? Second, you may look at which aspects and parts of your job you find most interesting. By looking at this you may find out in which direction you could develop. By doing this you may gradually sculpt your future job. A second skeptical question which is also obvious is: If you support people in following their interests will this not create the risk that they will only be willing to do things which are beneficial to them and not to the organization? The answer to this question is also no, for two reasons. The first reason is that most people are actually motivated to do things which are valuable to the organization. For example, research in neuroscience has shown that people have a natural and strong motivation to cooperate and help other people (Lieberman, 2013). Furthermore, most people have adapted to and internalized the norms, values, and interests of their environment (Ryan & Deci, 2011). In most cases people will not tend to make purely egotistical choices in how they will invest in their development. Lieberman says: “For most people in most lines of work, doing something meaningful means helping others.” The second reason why people will not disregard organizational goals when they follow their interests is that organizations can set goals, conditions, and performance expectations. They can offer autonomy within certain structures and expectations. A good example of this way of working is progress-focused directing (Visser, 2013) which is a way of setting expectations which creates a certain amount of autonomy for the employee. Effective managers will both achieve good results for the organization with their employees and contribute to a positive work experience and a good development of employees. Promoting interest-focused development seems like quite a good way to create such benefits. Amabile, T.M., & Kramer, S.J. (2011). The progress principle: Using small wins to ignite joy, engagement, and creativity at work. Boston: Harvard Business Review Press. Bakker, A.B., & Daniels, K. (Eds.) (2012). A day in the life of a happy worker. Hove Sussex: Psychology Press. Brehm, S. S., & Brehm, J.W. (1981). Psychological Reactance: A Theory of Freedom and Control. Academic Press. Dweck, C. S. (2011). Mindset, de weg naar een succesvol leven. Amsterdam: SWP. Elliot, A., & Dweck, C.S. (Eds.) (2005). The handbook of competence and motivation. New York: Guilford Press. Ericsson, K. A. (1996). The acquisition of expert performance: An introduction to some of the issues. In K. A. Ericsson (Ed. ), The road to excellence: The acquisition of expert performance in the arts and sciences, sports, and games (pp. 1-50). Mahwah, NJ: Erlbaum. Ericsson, K.A., Charness, N., Feltovich, P. and Hoffman, R. R. (Eds.). (2006). Cambridge handbook of expertise and expert performance. Cambridge, UK: Cambridge University Press. Kohn, A. (1993). Punished by rewards: The trouble with gold stars, incentive plans, A's, praise and other bribes. New York: Houghton Mifflin. Lieberman, M. D. (2013). Social: Why our brains are wired to connect. New York, NY: Crown. Ryan, R. M., & Deci, E. L. (2011). A self-determination theory perspective on social, institutional, cultural, and economic supports for autonomy and their importance for well-being. In V.I. Chirkov, R. M. Ryan & K. M. Sheldon (Eds. ), Human autonomy in cross-cultural context: Perspectives on the psychology of agency, freedom, and well-being (pp. 45-64). Dordrecht: Springer. Silvia, P.J. (2008). Interest—The Curious Emotion. Current Directions in Psychological Science, vol. 17 no. 1 57-60. Thoman, D.B., Smith, J.L, & Silvia, P.J. (2011). The resource replenishment function of interest. Social Psychological and Personality Science, vol. 2 no. 6592-599.